The following menu suggestions for Trinity Sunday, along with the pictures, were submitted by Angie from Jesse Tree Treasures. 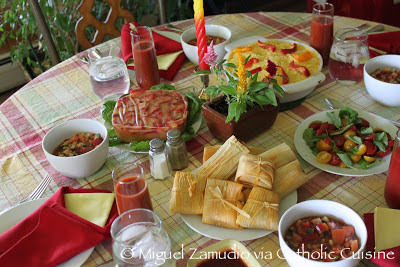 To celebrate Trinity Sunday (last year) we had Trinity tacos! The menu included a trio of fresh berries. And if you really want to go all out, you could do three meats with taco meat and fajita chicken and steak. We just stuck with taco meat. 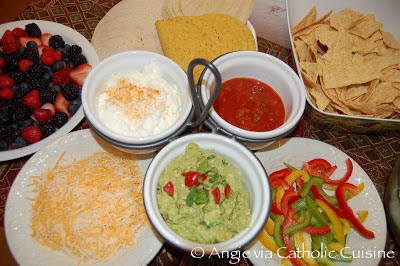 I used to be intimidated by the thought of making homemade guacamole, now I make it all the time, it is so simple. All you need are: 2-3 avocados (they should yield a bit to your finger pressure, but not feel hollow). Mash with a fork or two knives. If it is a little chunky that's fine, I like it better that way. Add sea salt, chili powder and lime juice to taste, and that's it! Yum! If you like to add things to it, try red onion, tomatoes, cilantro, and red peppers. Come Holy Spirit, fill the hearts of Thy faithful and enkindle in them the fire of Thy love. Send forth Thy Spirit and they shall be created. And Thou shalt renew the face of the earth. Today we celebrate Pentecost Sunday! 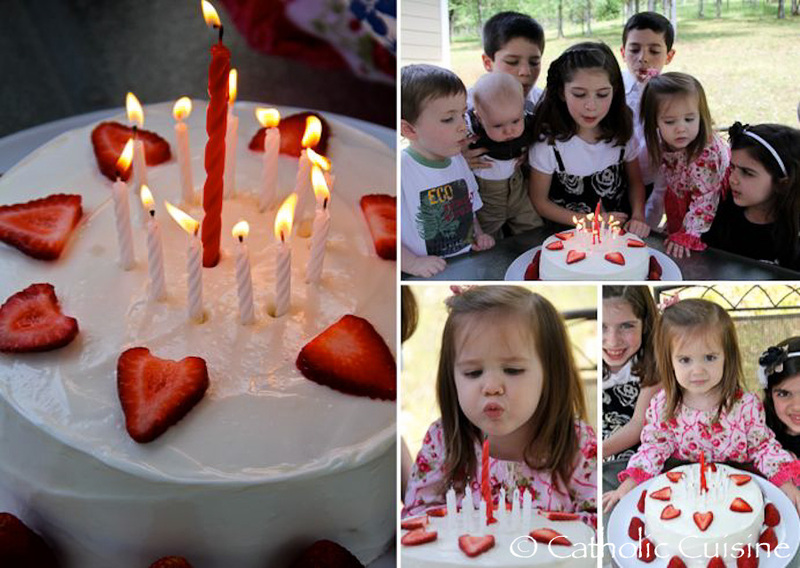 Since Pentecost if the Birthday of the Church, our family always celebrates with a birthday cake! Our cake is a usually a white cake with white frosting since Pentecost is also known as Whitsunday. 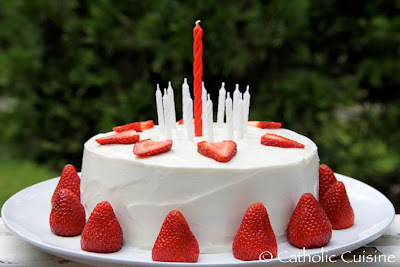 The large candle in center represents Christ our Light, who promised to send the Holy Ghost, and the 12 smaller white candles represent the 12 Apostle and the tongues of fire. 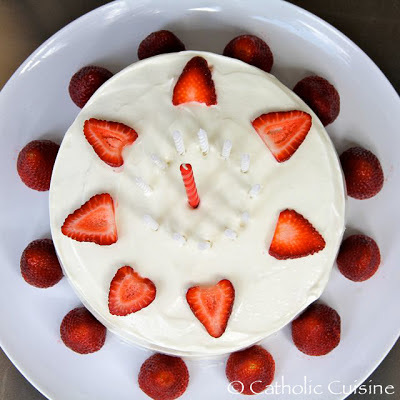 The 7 red hearts (strawberry slices on this cake) represent the 7 gifts of the Holy Ghost, and the 12 strawberries, placed around the cake, represent the 12 fruits of the Holy Ghost. You can find lots of other ideas for celebrating Pentecost in the archives and in last year's link-up. Be sure to take pictures tomorrow to share in the link-up below. 1. 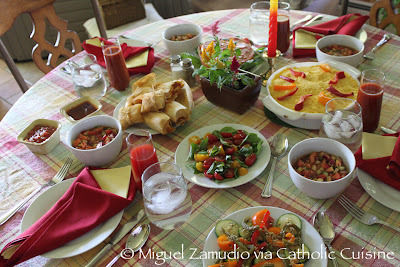 Create a post about your Pentecost Sunday celebration. 3. Add a link your post, referring back to this post so that others can find the link-up as well! Ingredients...Sliced strawberries (bananas used for eyes and wing tail). The following post was submitted by Adoro Te Catholic Home Educators. You can visit them on Facebook. The girls in The Little Women’s Hospitality Club did an amazing job creating this Cupcake Rosary for Our Lady! Adoro Te Catholic Home Educators of Connecticut capped off their annual end-of-the-year May Crowning with a Rosary. 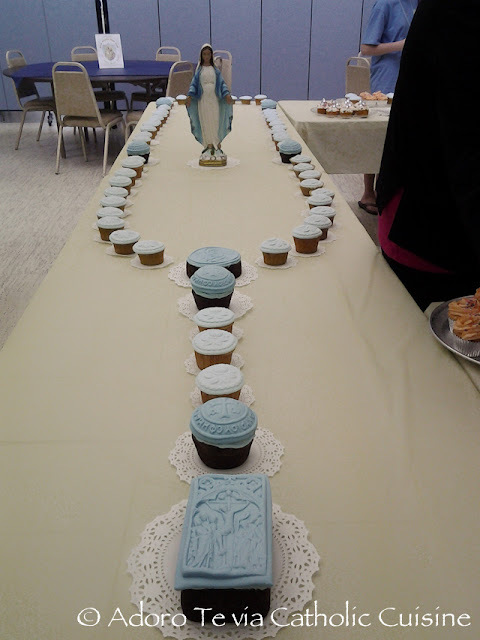 A cupcake Rosary, that is. 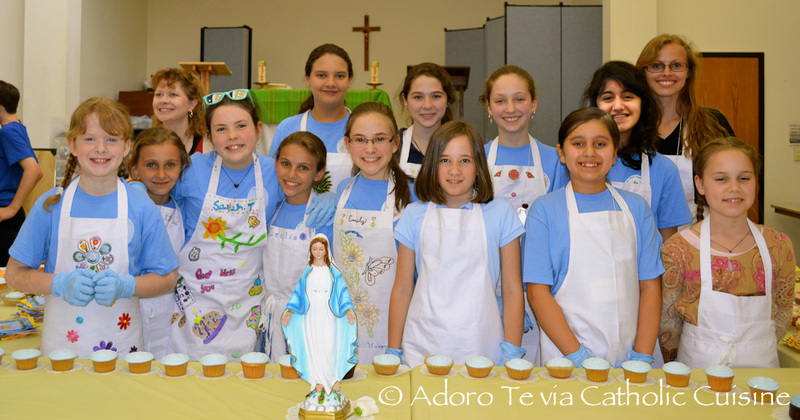 The 10-12 year old girls in The Little Women’s Hospitality Club (part of Catholic Children’s Clubs) baked dozens of fluffy “beads,” arranged the edible display, and served it to 100 hungry children and their moms. 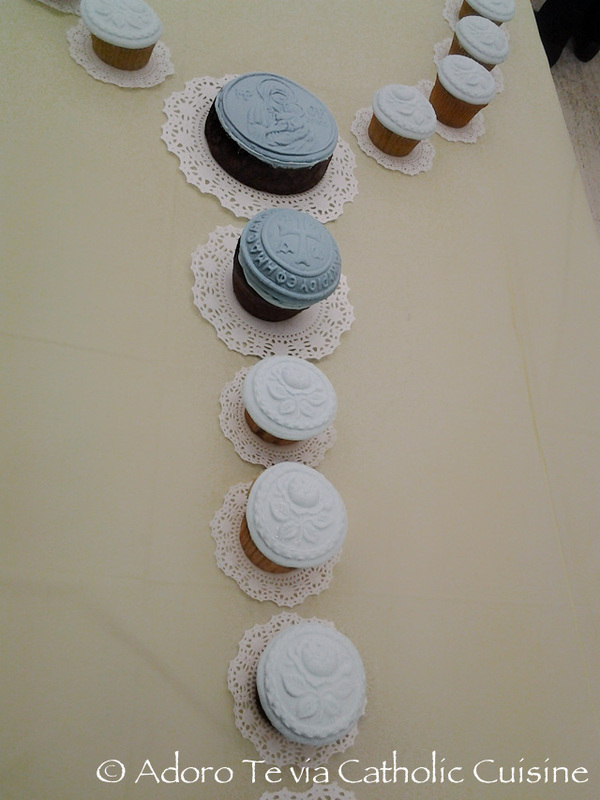 Each cupcake was adorned with an image stamped in marshmallow fondant. 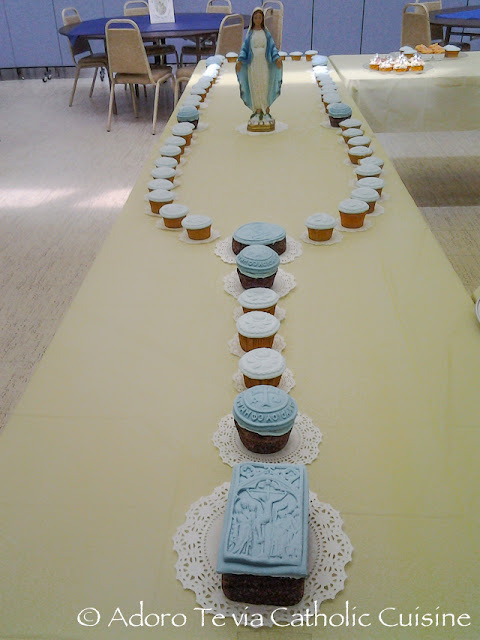 The Hail Mary beads (standard-sized cupcakes) were baked in brown cupcake papers and stamped with a rose cookie mold from The Springerle Baker. The Our Father beads (baked in a Texas cupcake pan *) were stamped with a Greek cross surrounded by a Greek inscription that reads, “May the Blessings of the Lord be upon you.” We used a bread stamp from Prosphora Stamp Central. The medal centerpiece was stamped with a Madonna and Child icon bread stamp, also from Prosphora Stamp Central, and baked in a Fat Daddio’s aluminum round cake pan. 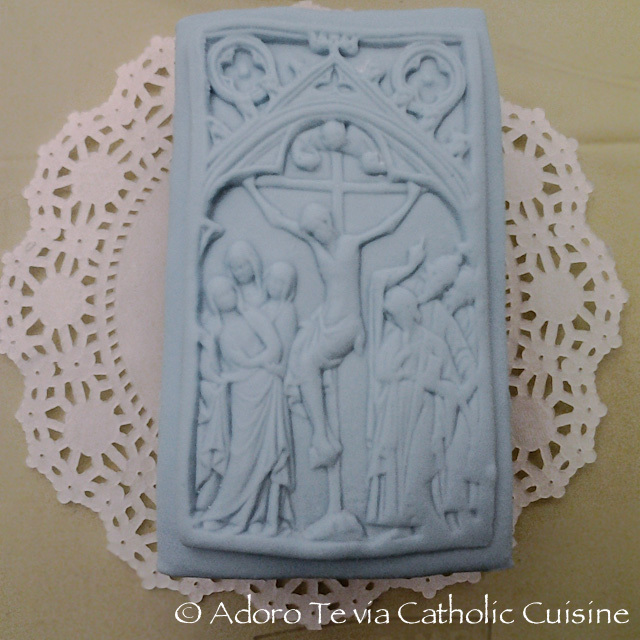 The crucifix was stamped with a Crucifixion springerle cookie mold from House on the Hill. It was baked in a rectangular Fat Daddio’s aluminum bread pan. *Baking tip: To ensure straight, even crowns on your Texas cupcakes, place one cupcake pan on top of the other. Spray both pans with cooking spray and fill one pan ¾ of the way with batter. Invert the second pan and place it evenly atop the filled pan for baking. 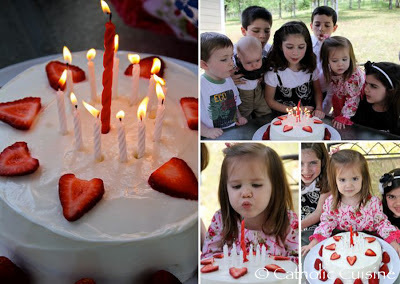 The recipe for the marshmallow fondant can be found here. Stamping marshmallow toppers: Dust your work surface and the stamp with powdered sugar. Roll out the marshmallow fondant like you would cookie dough. Press the stamp into the fondant, cut out design with a circle cutter, and remove the topper before stamping the next section of fondant. Be sure to dust your stamp every time you stamp the dough. Use frosting to attach the topper to the cake. 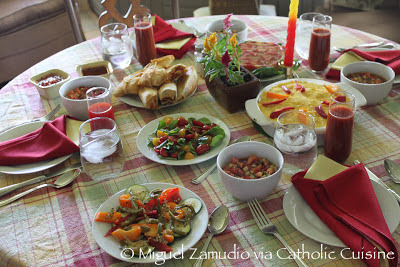 The following Pentecost Brunch menu and recipes were submitted by Kathryn Zamudio, and the photos were taken by her husband Miguel. Pentecost is the end of the Easter season. It is also the birthday of the church. This is a good opportunity to share the Easter season with our friends who could not make it to Easter due to family obligations. 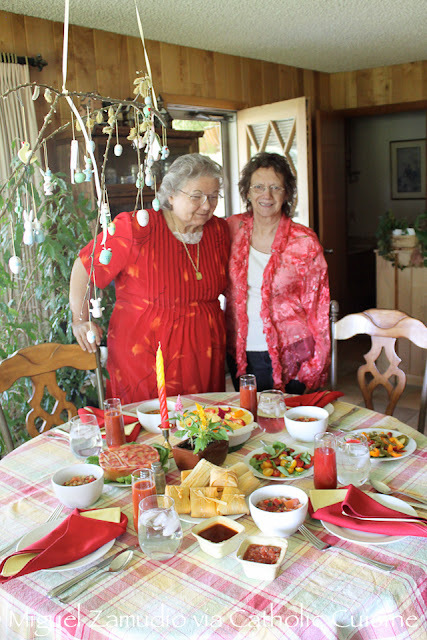 This time of the year, wild fires in New Mexico bring heat and wind, reminding us of the symbols of Pentecost. This brunch menu is hot, fiery and windswept, just like Pentecost and New Mexico. 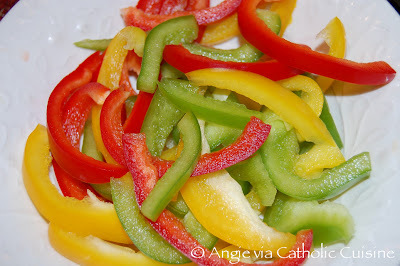 Cut 6 thin slices from each bell pepper; reserve slices. Chop remaining bell peppers. Cook pork, sausage, onion and garlic in 4 quart Dutch oven over medium heat, stirring occasionally, until pork is no longer pink. Stir in chopped bell peppers broth, basil, cilantro and ground red chiles. Heat to boiling; reduce heat. Cover and simmer 30 minutes, stirring occasionally. Stir tomato, squash and olives into meat mixture; cook 15 minutes longer. Heat oven to 425º. Prepare Corn Bread Topping by mixing all ingredients; beat vigorously. Pour meat mixture into ungreased rectangular baking dish, 13 x 9 x 2 inches. Pour Corn Bread topping over meat mixture; carefully spread to cover, sealing to edge of dish. 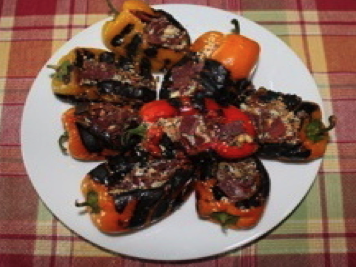 Arrange reserved bell pepper slices on top to resemble tongues of fire. Bake until topping is golden brown, 15 to 20 minutes. If you cannot find bulk chorizo sausage in your local grocery store, you can make your own. Substituting ground turkey will give you a chorizo with less saturated fat. 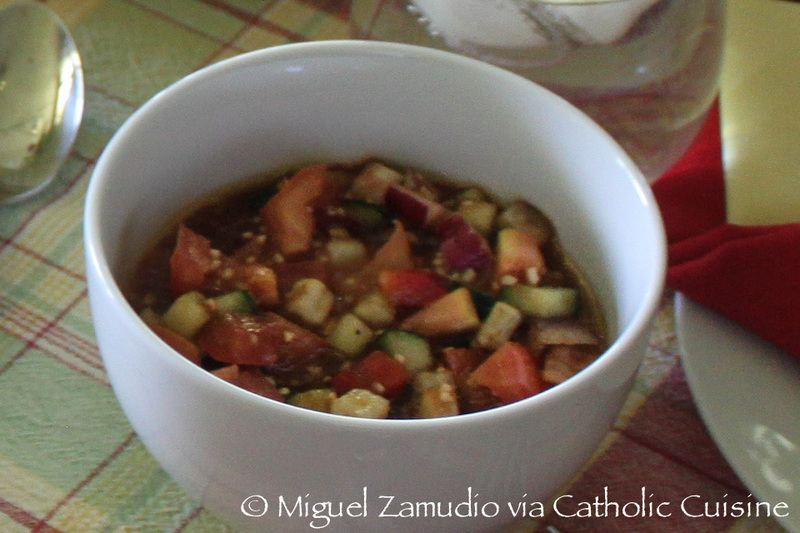 Combine all ingredients except vinegar in a large bowl and chill for about 1 hour. Add vinegar to the meat and mix thoroughtly until it has a uniform appearance and stickiness. Test for seasoning by sautéing a small sausage patty until cooked through. Taste and adjust flavorings as necessary. Put chiles directly on stove burner and cook until charred, turning as necessary. Let cool, then slit open. Microwave bacon until crispy. Chop bacon and set aside. Add olive oil to pan and heat over medium heat. Add garlic, cook 1 minute. Add onion and cook until sot ( about 5 minutes). Add oregano and cumin and cook 1 minute more. Let cool. Add cheese, pecans and chopped bacon to mixture and mix well. Fill prepared chiles. 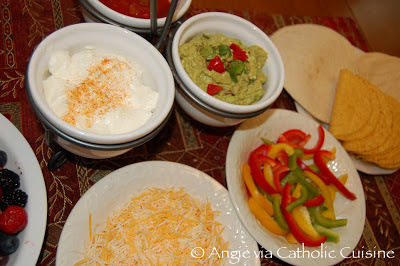 Place stuffed chiles on oven proof dish and bake for 10 minutes. Chop half the radishes finely. Mix with cream cheese and salt. Spread on 6 slices of bread. Cut remaining radishes in half and put half a radish on each sandwich with the red skin on top. Garnish with a twig of parsley. Butter slices of bread, garnish with thin slices of smoked tongue. Mix mayonnaise, horseradish, sugar and salt. Spread on slices of tongue. Core and roughly slice cabbage into thin strips an inch or two long. Place strips in colander nested in larger bowl and pour enough very hot water over to cover. Soak 7 minutes. Using more vinegar than water, mix the two to taste creating a total of 1 cup liquid. Dissolve in sugar and salt (again, to taste whether you like it sweeter or more sour) Add a grinding of pepper, then whisk in the oil. Remove colander from bowl; allow cabbage to drain well and cool. While cooling, dice onion, green and yellow peppers. Toss together peppers, cabbage, and drained mushrooms in a nonmetallic salad bowl. Pour salad dressing over slaw and marinate in fridge, covered, overnight or for at least four hours. Since we live in the Southwest, we just buy our tamales. Making them is too much effort, and we can get many different varieties. 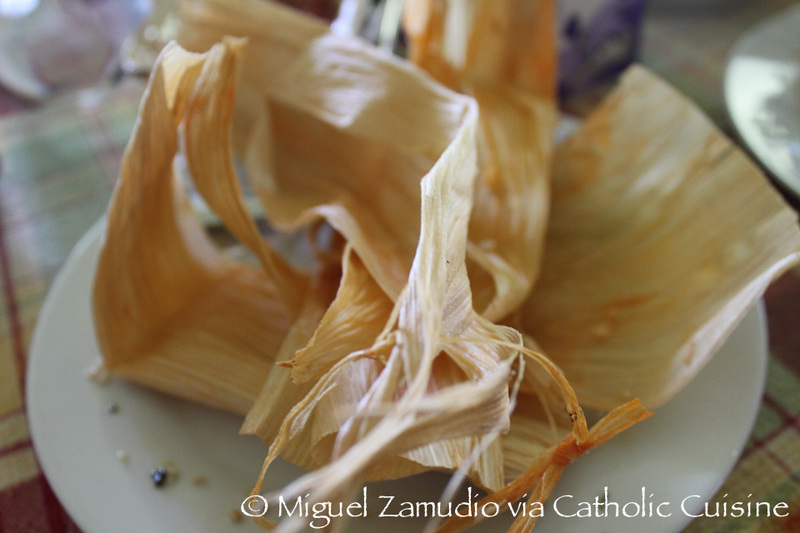 If you live in a tamale deprived part of the country, here are the recipes. Place masa harina in a large bowl. Pour in hot chicken stock and combine well with a rubber spatula. Cover and let stand for 30 minutes. Add remaining ingredients, mix until thoroughly combined and adjust consistency with warm water. Preheat the oven to 350°F..
Heat the oil in a large skillet and brown pork in batches. Set the pork aside. Add the onion to the skillet and sauté until golden. Add the garlic and sauté for 1 minute. Deglaze the skillet with one cup of the chicken broth, loosening the browned bits with a spoon. Add the coriander, cumin, oregano, red-chile powder, honey, vinegar, and salt to the pan. Add the cooked onions, garlic, and broth. Place the browned pork, chile marinade in an ovenproof pot or dish, stir to combine and bake for 1 hour or until pork is tender. Shred pork with two forks until desired consistency is achieved. Place masa harina in a large bowl. Combine water, spinach, onions, and espazote in a blender; purée for 1 minute. Add this blend, baking powder, and salt to masa harina. Combine well. Add fat and combine well. Add warm water until light, sticky dough is achieved. Cover and reserve. 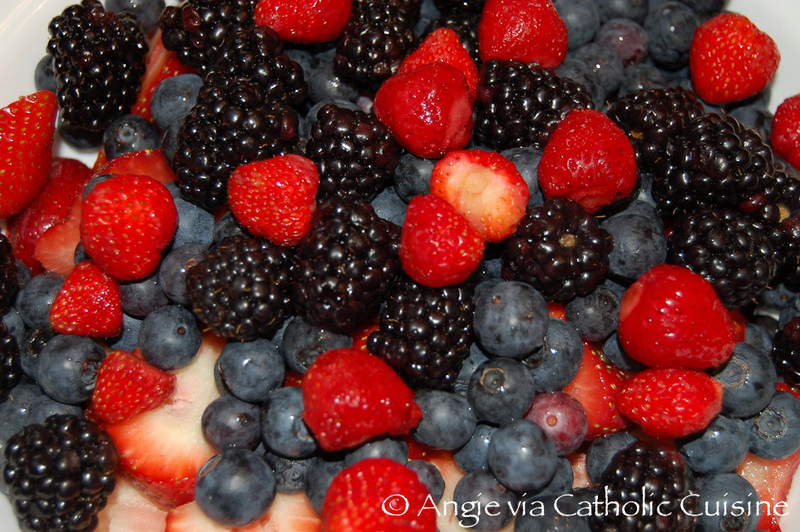 Place ingredients in a large bowl and mix until combined. Place mixture in a pastry bag with a large, round tip. Line a baking sheet with plastic wrap or parchment paper. Pipe cheese mixture onto the lined baking sheet and freeze mixture for 1 to 2 hours. Remove cheese from freezer and cut into 1½-inch pieces. Place pieces in a plastic bag and store in freezer until needed. Pre-soak your corn husks in water until pliable. 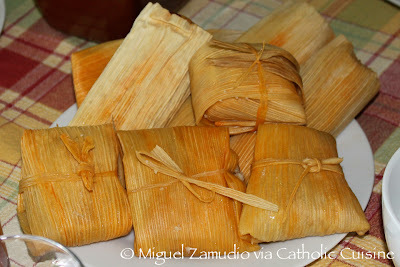 Layer a tablespoon of masa and filling inside. Fold each side of the hust over the filling so the filling is covered. Fold both ends of the husk over. Fold them in the same direction so all the flaps face down. Using narrow strings pulled form a husk, tie a bow around the package to keep it closed. Again, we can buy this premade in any of our local Latin stores. Rinse chiles and split open, discarding stems, seeds, and ribs. Heat a well-seasoned cast-iron skillet over moderate heat, then toast chiles, skin sides up, in batches, about 30 seconds (be careful not to burn them, or sauce will be bitter). Transfer chiles as toasted to a heatproof bowl and pour boiling water over them. Cover bowl and soak chiles, stirring occasionally, until softened, about 15 minutes. Purée chiles with three fourths of soaking liquid, reserving remainder, in a blender until smooth (use caution when blending hot liquids). Pour purée through a coarse sieve into a bowl, pressing on solids, and discard solids. Whisk reserved soaking liquid into chile mixture. Cook onion, garlic, cumin, and oregano in oil in a large heavy saucepan over moderately low heat, stirring, 2 minutes. Add flour and cook, stirring, 2 minutes. Whisk in chile mixture and simmer, partially covered, whisking occasionally, until reduced to about 2 1/2 cups, about 30 minutes. Season with salt, vinegar, and sugar. 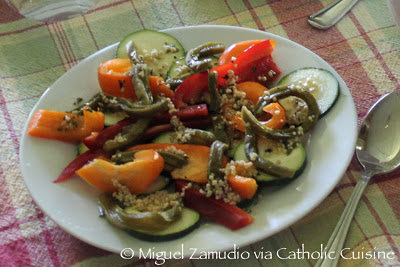 Mix nopalitos, zucchini and bell pepper. Set aside. Mix ingredients for cilantro vinaigrette. shake all ingredients in tightly covered container. Pour vinegarette over salad and serve. 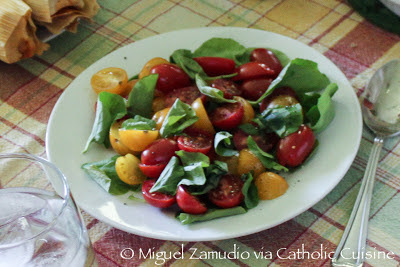 In a large bowl, combine the red and yellow tomatoes, watercress, and 3 tablespoons of the chives. Season with salt and pepper. Drizzle the olive oil over the salad and toss to coat well. Build the liquid ingredients into a highball glass. Mix well. Add the seasonings to taste. 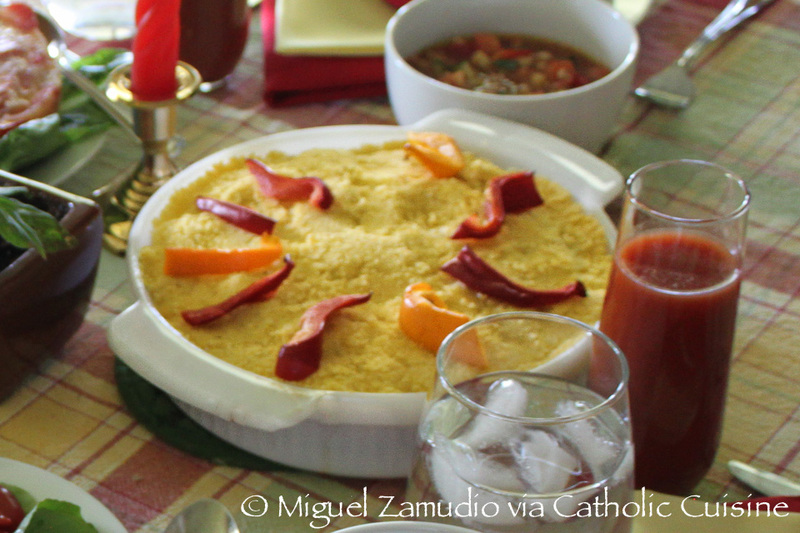 Additional recipes for Pentecost can be found in the archives.